The Libraries continues to focus on supporting the university’s 10 academic faculties, responding to the changing needs of the university’s academic directions and research areas. With support from our alumni and friends, we continue to acquire rare and significant works and offer the rich collections and services required of a top-tier academic library in the 21st Century. Acquisitions currently available range from traditionally published books to digital based collections that exist only online. 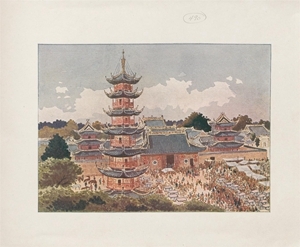 Spanning three centuries (c1750-1929), this digital collection makes available for the first time extremely rare pamphlets from the Charles W. Wason Collection on East Asia, at Cornell University Library; one of the oldest and most distinctive collections of its kind, and a very rich source for research on China. The Wason Pamphlet collection has been digitised in its entirety and in full colour. It is full-text searchable, allowing for the collection to be comprehensively studied and fully appreciated. An image gallery showcases the superb colour illustrations and highly designed cover art. Covering the 18th and 19th centuries, China, America and the Pacific provides primary source materials for the study of the history of North American trade and cultural exchange with China. This collection also provides coverage of China’s economic dealings with the whole of East Asia and the Pacific. Until the opening of the Western frontiers of the United States in the mid-1800s, the East Coast dominated American finance and merchanteering. This early period in American trading history is captured in the papers of key shipping families and their extended influence beyond maritime circles. China, America and the Pacific offers insights into the early commercial development of New York, Philadelphia, Boston, Salem, Providence and Baltimore, with maritime routes between East and West Coasts detailed and mapped. Other key Pacific trading posts are covered, including Hawai'i, the Philippines, India, Sumatra, Mauritius and Batavia. Early fur traders in Canada and the Pacific Northwest are also well covered. All cited costs are estimates only.